Father’s Day gifts get harder and harder to buy the older you and your dad get. He doesn’t need any more homemade ashtrays, ties, cologne or even golf shirts (sorry NikeGolf, Greg Norman Golf, Cutter & Buck, Under Armour and the like, but it’s mostly true). 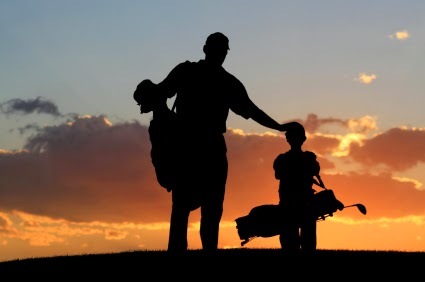 2) A golf package is a concrete way to show your dad that you are really grateful for him and his role in your life. 4) Not only will you show him you care and get to visit, but you’ll also create lasting memories in the process… and maybe even start a new tradition in your family. 5) The fifth and bonus reason is that your mom will also get a gift when you squire your dad away to a golf resort… either she will love the downtime by herself or she’ll negotiate her own getaway. Whether it’s a beach golf vacation or girlfriend’s spa getaway, she makes out like a bandit. At LetsGolf.com, you can research and choose just the right golf vacation destination for you and your dad. Our resorts include (but are not limited to) Auburn-Opelika Marriott at Grand National on the RTJ Golf Trail for the best inAlabama golf; Sea Trail Golf Resort in Sunset Beach, for a North Carolina golftrip; Lakeview Resort or The Resort at Glade Springs for your choice of a West Virginia golf resort; Kiva Dunes Golf & Beach Resort in Gulf Shores, for a golf beach vacation; Kentucky State Park Resorts for a laid back Kentucky golf getaway; L’Auberge Casino Resort in Lake Charles for a fun-filled Louisiana golf trip; Hollywood Casino Resort and the Arnold Palmer Bridges Golf Club in Bay St. Louis for a Mississippi golf experience; or Santee Cooper Resort in the heart of South Carolina golf country. You can call the resort directly or book tee times online and make your lodging reservation directly. And for a bonus gift, you can even get your dad one more golf shirt in the pro shop with the resort logo on it for a great souvenir.